The Death of Truth (2018) offers an informative look at the current political climate in the United States, and the many developments in the past that have brought us to this divisive time. 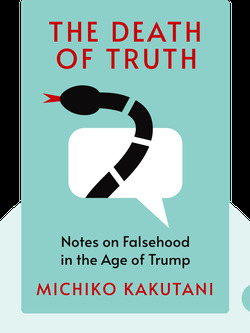 With over 30 years’ experience as a respected literary critic, Michiko Kakutani uses her expertise in modern literature to show how authors of the past worried about many of the same concerns we’re facing today. There has always been opposition to reason and progress, but it went mainstream in 2017. Some of the guiding principles of the founding of the United States of America were drawn from the Enlightenment of seventeenth- and eighteenth-century Europe, with its emphasis on reason, liberty, progress and religious tolerance. But throughout the nation’s history, there have been people who opposed these principles. In 1839, Abraham Lincoln gave a speech known as the Lyceum Address, which emphasized the importance of reason in keeping tyranny at bay and preserving the rule of law in the United States. But even then, there was a separate ongoing narrative being kept alive by people working to undermine reason and progress. In 1855, this counter-narrative was perhaps best represented in the political arena by the right-wing Know Nothing Party, staunchly anti-immigrant and anti-Catholic, and counting 43 members of Congress at the time. Those who supported the Know Nothing candidates weren’t much different to those who push back against progress and reason today: they’re part of a working class that feels marginalized and dispossessed of any agency, a fact that they tend to blame on progress made due to globalization and technology. Writers have given this opposing movement different names over the years. Philip Roth called it “the indigenous American berserk,” and Richard Hofstadter called it “the paranoid style.” This counter-narrative has always been alive and survives just under the surface of the nation, not unlike a dormant virus waiting to reactivate. It wasn’t until recently, in 2017, that it went mainstream. Conspiracy theories and extremist views around religious and racial intolerance, which had largely been kept out of the national spotlight, started being written about by Breitbart bloggers and getting supported with retweets by President Trump that year. We can see the actions Trump has taken against reason and progress by his choice of leaders for government institutions. Rick Perry once called for an end to the Department of Energy, and against all reason, he is now running it. Likewise, Scott Pruitt is now the head of the Environmental Protection Agency, which he has sued multiple times in the past. These important agencies have been rolling back their efforts and programs concerning renewable energy and the environment. Although there’s been a rise in information options, the internet has created dangerous filters, silos and tribes. Postmodern theory and subjectivism are being used to bolster division and a self-serving agenda. Fake news is being used as a propaganda tool, especially by Russian agents seeking to disrupt. Trump’s nihilistic, troll-like behavior, as well as his lies and twisting of language, have dangerous repercussions. A new kind of nihilism is breaking out across the United States. Start your free Blinkist trial to get unlimited access to key ideas from The Death of Truth and over 3,000 other nonfiction titles. With bitesize text and audio, it's easier than ever to find the right ideas to transform your life.